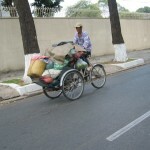 The capital Vientiane seems almost in slow motion after the sensory overload of Vietnam, almost like a big country town. The little things like a roadside conversation without shouting, no street vendors or hawkers (feels strange to actually have to wave down a taxi/cyclo). The city sits on a bend in the river which is now hundreds of metres wide, although after a long dry season, vegetables are being grown in the river bed. Each afternoon we congregate to the riverbank where mobile vendors quickly set up tables and chairs and enjoy a plate of beautiful cheap food and a cold drink as the hot sun drifts away. Perfect way to end the day. The seven hour drive from Vientiane to Luang Prabang passes through spectacular mountain ranges. Unfortunately tainted with smoke haze from forest fires, but nonetheless a sparsely populated and seemingly endless mountain vista; worthy of a national geographic cover photo. The entire drive would barely have a straight section of road more than 50 metres long and our driver drove like he was being chased by the law, screeching tyres at every corner. Yet then stops at each village to get water for the overheating radiator and wheel brakes! 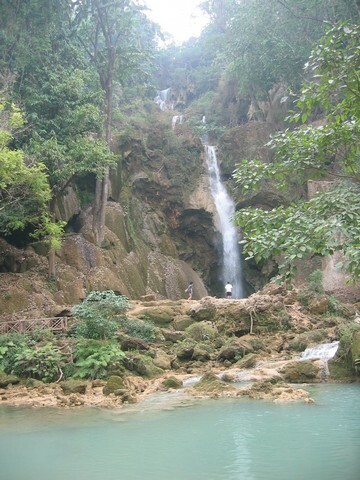 Luang Prabang is the tourist drawcard for Laos. An ideal location between the high banks of the Mekong River and the surrounding mountain jungle, the French influence still evident in the buildings and restaurants. One can pass the day walking or riding a bicycle around the town and surrounds, take a taxi to the nearby waterfall complete with rope swing for a cool swim. 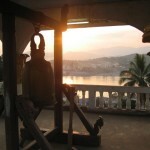 Visit the numerous monasteries to sit with the monks and learn more of their culture in exchange for English lessons. 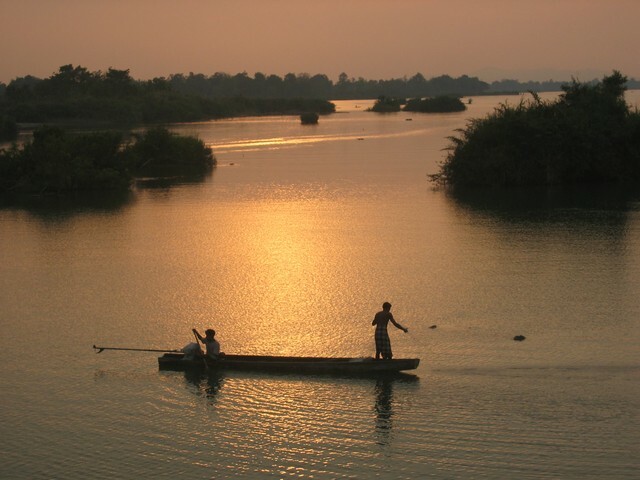 Or find a spot on the banks of the Mekong and observe Laos river life, especially late in the afternoon with the setting sun and a cold Beer Lao. 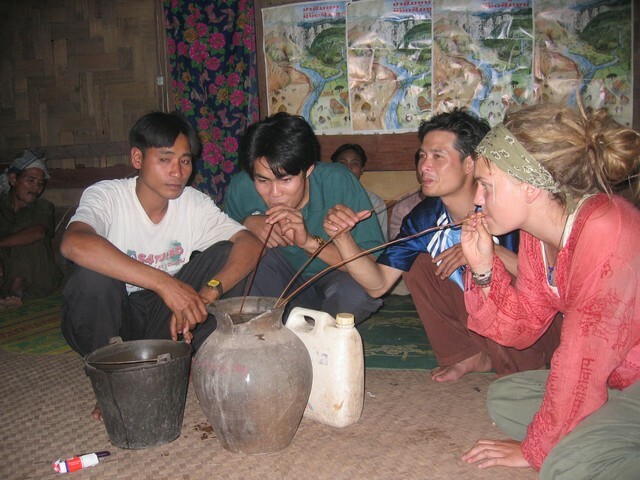 The open warmth and friendliness of the Laos people adds to the whole experience here. One warm clear night walking home from the bar we were drawn to music at a private house party. On walking past were invited in, offered beer and food, and before long danced and partied the night away with our new-found friends. Were told the following day it was a party for the deputy PM of Laos! Muang Ngoi barely rates a mention in the LP guidebook. 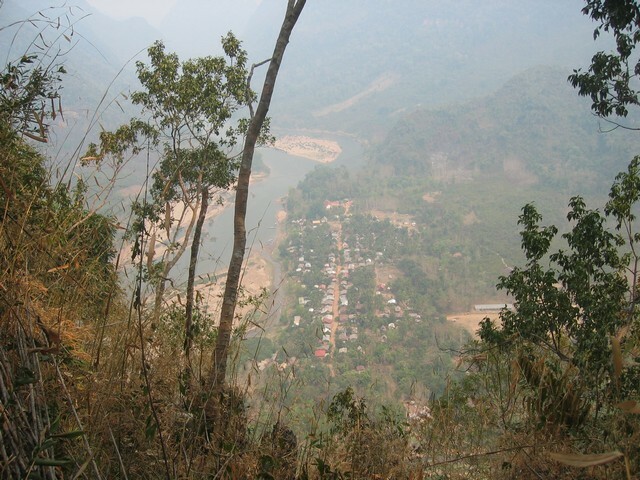 Access is four hours by road from Luang Prabang – the nearest settlement of note – and a further hour by boat upstream of a river, the name of which I don’t recall. A tiny village with only four hours of electricity a day – sourced from small hydro generators in fast running water. Perched high on a river bank deep in the jungle with mountain ranges stretching the four points of the compass; a place where I would spend the most incredible and amazing 5 days. Due to its inaccessibility via road, there are no vehicles, not even a motorbike. The village is barely a hundred metres long with one dirt street populated with chooks, pigs, turkeys and geese. Couldn’t understand why one turkey kept attacking myself and others as we walked past, until late in the week saw a boy about three years old dragging it around by the flap of skin on its neck – little wonder it hated people. My bamboo thatch bungalow complete with hammock and balcony sitting some ten metres above the riverbed, overlooking the 50 metre wide river and outstanding views of the mountain landscape, is costing me the princely sum of US$1 per night! 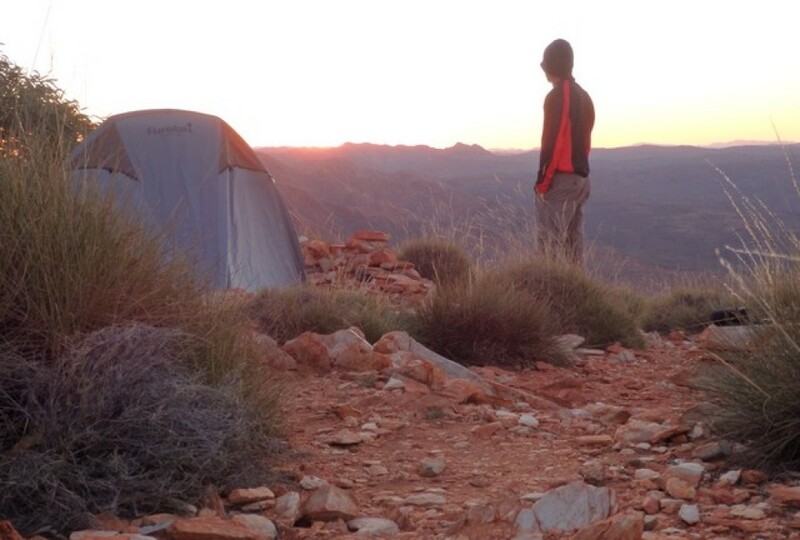 A gruelling hike led by one of the locals to summit a nearby mountain. My partner in crime Andy and I approached another of the locals and offered a few dollars to hire his dugout fishing canoe for a few hours. No-one had ever approached him with such a proposal before, he was a little apprehensive at first, but confident we planted the seed for a future business opportunity. We did however have a moment in some rapids with myself being sucked under the canoe and coming incredibly close to grief and what would have been the demise of his boat and livelihood! We hiked through the jungle to a remote nearby village; given their surprise and wariness on our arrival, rarely visited by foreigners. Assisting the local lads with some river fishing which whilst unproductive, very enjoyable. Due to the limited refrigeration our menu each night was determined by what they were able to catch or hunt that day. One day a wild pig, the next a 3kg fish, and another day was deer! The highlight of the week however was the wedding and the open invite to all in the village including us! Three of us thought it pertinent that something be taken as a gift for the bride and groom and after a long session of brainstorming we had our legacy….3 bottles of Beer Lao! Lame as this may seem, none of the other foreigners thought to do the same. Our masterstroke resulted in an acknowledgement during the speeches and a visit to our table from the bride and grooms parents for a celebratory drink! Other than Beer Lao which is possibly the best beer I have ever had the pleasure to consume, the other favoured tipple is Lao Lao. Not commercially available but rather brewed and consumed at virtually every village in the country, is said to be around 80% alcohol, always drunk neat and tasting something akin to petrol. A night of dancing and drinking followed by a morning of memory loss, hurting heads and ill stomachs. The insidious Lao Lao had struck down all but the hardened locals who informed us that the previous night was only the pre-wedding party; the wedding was today – we raised the white flag and watched from a safe distance. It’s Kate, my daughters 5th birthday. So I bid a very sad farewell to my jungle paradise to begin the hour boat ride, followed by four hours on the road, to the nearest phone to wish her happy birthday. 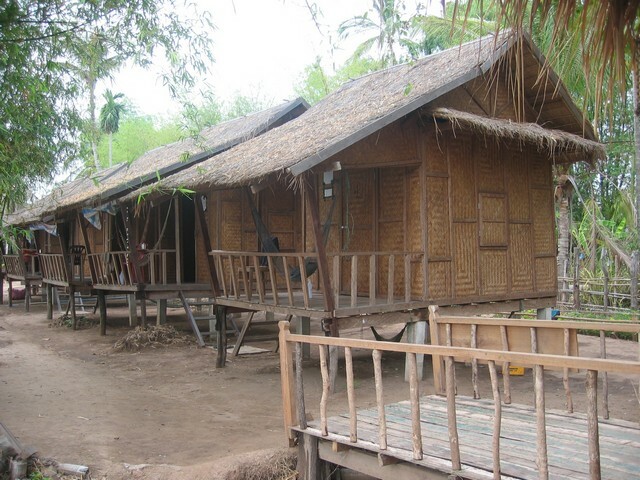 Life in Muang Ngoi is stripped to it’s basic core – beautiful in it’s simplicity. As I and others wax lyrical about its virtues, change will come swiftly and its innocence surely lost. Walking off the beaten track anywhere in Laos is fraught with danger with many unexploded ordnance scattered across the country. As I believe, Laos signed a Geneva agreement in 1962 which recognised it as a neutral country in any hostilities with Vietnam. Despite this, USA and other allies dropped on Laos an average of one planeload of bombs every eight minutes, 24 hours a day for nine years! 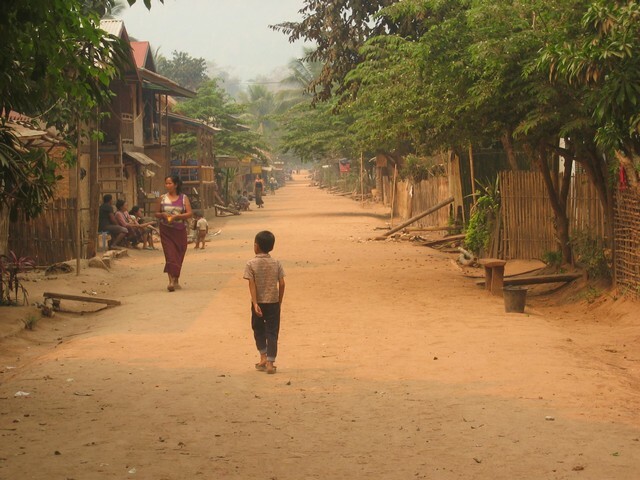 Not to mention defoliant and herbicides; this gives the Laos the unenviable title of the worlds most bombed country….and it was not engaged in conflict. 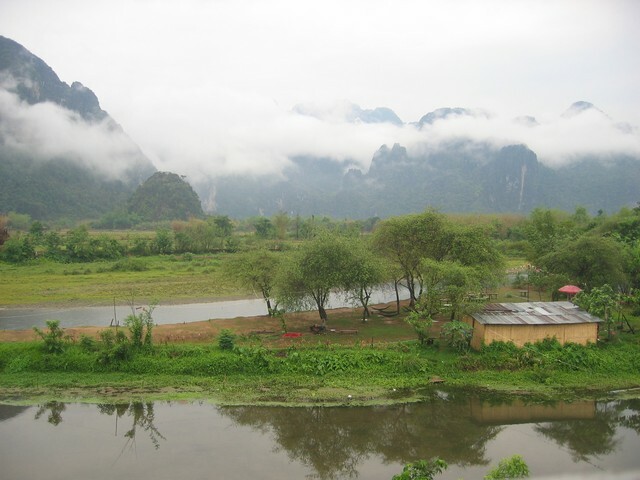 Deep in the mountains close to the Chinese border, travellers to Luang Nam Tha are either passing through en route to China or wanting to trek in the nearby National Park. My visit was for the latter. The two-day wait until enough people signed up for a trek had me wishing I was still in Muang Ngoi. The region in which we trekked over two days was picturesque, although the trek was not particularly challenging, and the views were a little blemished with the smoke haze that will linger until the wet season commences next month. A swim in the river with the children from the village where we had our overnight stay, and helping the village chief celebrate his new house that night were certainly highlights. 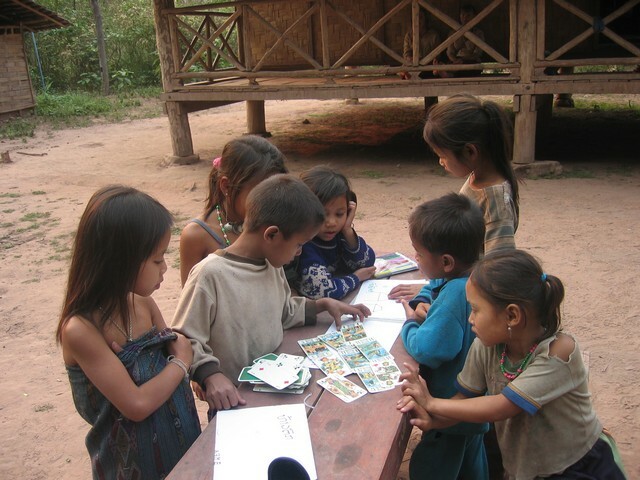 I am continually humbled at the generosity and kindness shown by the Laos people. None more so than the 4 teenage boys riding past Andy and I on their bicycles early one evening as we sat outside a cafe. 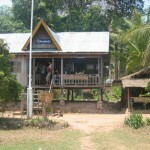 After a brief conversation we went with them to a disco about two kilometres out of Luang Nam Tha. We bought the drinks and tried unsuccessfully to match their dancing prowess which included backflips and other impossible acrobatics. After the disco had concluded they accompanied us with their bicycles back to town as we were not entirely certain of the location of our accommodation. Only then did we discover they lived some distance the other side of the disco venue. Three days overland travel back to the capital of Vientiane was not particularly appealing, flying was definitely the preferred option. When the small plane touched down on the short runway, passengers – and luggage – were unloaded and reloaded with new passengers, in less than 15 minutes; efficient or careless! Found myself sitting next to the wife of the Australian Ambassador to Laos who said the airlines safety record was less than impressive. The views from the window over Laos mountainous northern interior was however impressive and distracted ones thoughts from any impending doom. 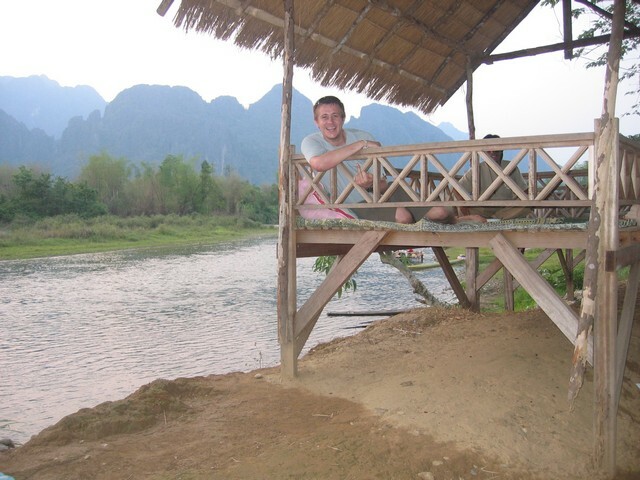 If there is anywhere in Laos to spend a few days and chill it’s here in Vang Vieng, a small town on the Nam Song river. The main street lined either side with small restaurants, all with raised bamboo thatch floors complete with cushions to kick back, watch movies and laze the day away. 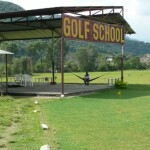 Those more adventurous can hire a bicycle and ride out and explore the caves or swim in the nearby stream complete with crystal clear water and rope swing from the overhanging tree. To leave here without undertaking the trip down the main river on a tractor tyre tube, beer in hand and participating in the activities along the way – such as a 10 metre cliff jump, giant rope swing and numerous others – would simply be sacrilege. Simple in its design but a brilliant way to spend a day. The curfew laws that are enforced elsewhere in the country don’t seem to apply here. A leniency you are grateful for when sitting with new-found friends at a bar beside the river, moonlight reflecting off the water and silhouetting the mountain ranges in the background – perfect. The ten-hour overnight bus from Vientiane to Pakse was modern, A/C, comfortable and uncrowded. Pity the TV with karaoke at high volume right through the night. Preferred the three-hour bus from Pakse to Don Det Island despite it being antiquated, oppressive, and the small plastic stool for a seat in the centre aisle, above which the rain leaked through the roof. Was so overcrowded that anyone leaving or boarding – which occurred every few hundred metres – did so via the windows. Don Det Island is located in Si Phan Don, otherwise known as ‘four thousand islands’. 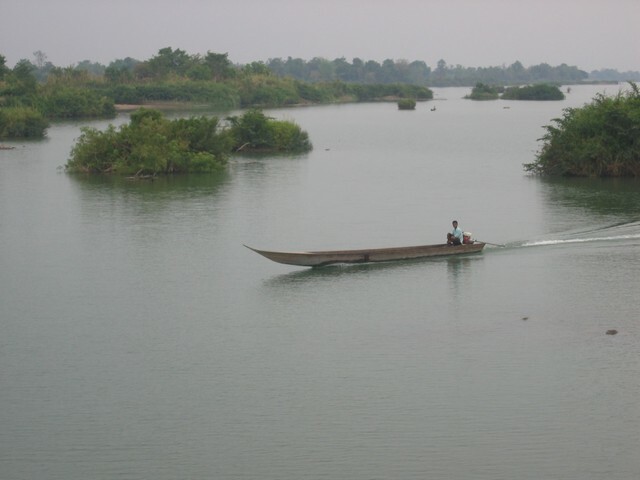 The Mekong river in this area just north of the Cambodian border is up to 14 klms wide. 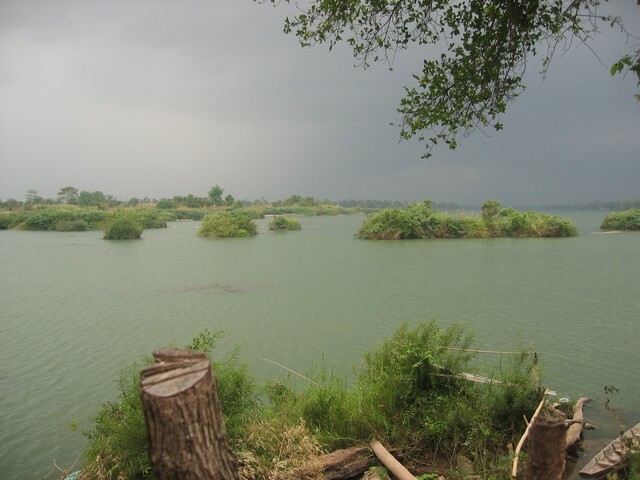 When the water recedes in the dry season, thousands of ‘islands’ appear to accompany the permanent islands such as Don Det. 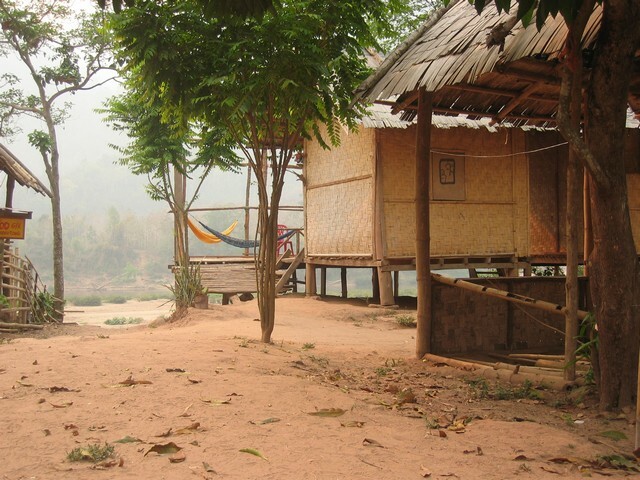 Like Muang Ngoi, I again have a bamboo thatch bungalow with hammock and balcony on the water’s edge for $1 a night, and this time room service Laos style – with a wave of the hand to the kitchen only ten metres away. Bravely on occasion I left my hammock, including a bicycle trip to the opposite end of the island. From here a guide accompanied us out on the river in a dugout canoe to see the extremely rare Irrawaddy dolphin (perhaps as few as 100 left). Mid April is the Lunar New Year celebrated throughout the country. This 3-4 day festival centres around water or more precisely throwing water on anyone you see, and with April being the hottest month of the year, there are few complaints. Children will appear from nowhere and attack with water pistols, buckets and anything else they can lay their hands on. 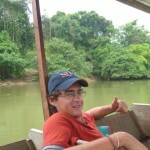 Our role was to catch them and throw them in the river where we inevitably join them in the cool deep water. 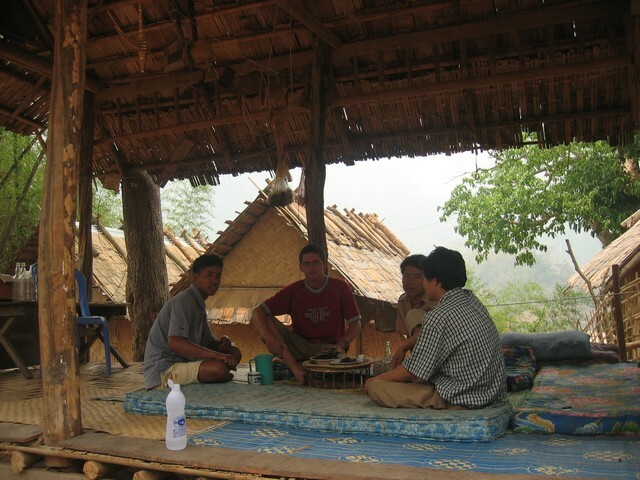 The adult’s have an additional tradition in which they will approach you with a shot of Lao Lao whisky, even first up in the morning and refusal of the first drink is said to be offensive. At the invite of some teenagers we accompany them in a small boat to a section of beach on the ‘mainland’. The sand serves as the dance floor between the live band and a large area of temporary shade made from palm leaves, under which are tables, chairs and a bar selling hot beer and ice. Other than very brief forays onto the hot sand for a dance, we opt instead for beers in the shade and swimming in the river. Incredible to watch hundreds of local teenagers dressed in their Sunday best – the boys are wearing denim jeans and long sleeve shirts – dancing in the midday 40 degree C heat. Mid afternoon we move to a different venue on another island, where easily 1000 people – again we seem to be the only tourists – are dancing and celebrating, this time hot beer and no ice! With the festivities over and an expired visa, we head to the nearby border crossing into Cambodia. The hospitality shown to us by the beautiful, friendly, laid back people of Laos – despite the Vietnam war which continue to plague parts of the country and a GDP so low it remains one of the poorest countries on the planet – has been inspirational. This entry was posted in Where to visit in Laos and tagged Beer Lao, border crossing between Laos and Cambodia, Don Det Island, Lao Lao, Luang Nam Tha, Luang Prabang, Mekong River, Muang Ngoi, Nam Song river, Si Phan Don, travelling in Laos, trekking in Luang Nam Tha, Vang Vieng, Vientiane, water festival in Laos by danthewanderer. Bookmark the permalink.